Yesterday, Nielsen released their ‘State of the U.S. Media Universe – Audiences and Devices‘. Larger PDF available in the preceding link. The mobile metrics are especially fascinating. Those 13-17 year olds are burning up the SMS wires! Mobile Future releases their over the shoulder ‘look back’ at the year that proved to be (finally) the legitimate ‘Year of Mobile’. We’re seeing more and more instances of ‘TV on the go’ – everything from streaming your NetFlix queue through your mobile device, to downloading your favorite TV shows through iTunes (which just got a LOT cheaper) to live TV via dedicated devices. Flo TV is one of the first to come through on the last example, but also has the cross over to your smart phone as well. With the opening of College Football season this weekend, they made a large commercial push through Saturday’s games. I’m biased, but I thought this was a great ad. Go Ducks! I’ve been a Blackberry user for a long time – a really long time. I’ve become a master of the ‘intuitive’ text feature (with only one phrase being the bane of my existence, but that’s another story) and I’m a fan of the small form factor of the Pearl 8110 – it fits easily in your front pocket, does most everything I need it to do, and is a very reliable device. We’re pretty excited about the opportunities that are presenting themselves in the mobile space and are intent on creating some innovative and first mover programs that bring the Intel brand to a ‘third’ screen. We’ve already done some good work in the Americas with our iPhone app and our Global team has partnered with a leading mobile agency and a leading web-based streaming music company to create a compelling mobile experience that gives iPhone users a unique ‘station’ modeled after the 3 types of ‘Core’ processors – each providing a unique listening experience. This is the first time a custom channel has been developed for a mobile device on Pandora – kudos to our Global team for making that happen. Stay tuned – it’s going to be an exciting ride on the Mobile Web for us this year. It’s no secret – 2010 is the year of the Mobile Phone – every analyst, journalist, and pundit are stating their case on why this is the year that mobile finally rings the proverbial bell of success. As a marketer, I certainly see that it is very important to focus on this ‘emerging’ platform – people are using their mobile devices in more robust ways than ever and, sometimes, even abandoning their computer all together and relying on their handheld as their only ‘connected’ device. According to Mary Meeker’s Mobile Internet Report, the #1 driving force for the uptick in mobile is Social Networking (slide 30). The number of people accessing their favorite social network or taking a social ‘action’ on their mobile device has sky rocketed over the last year. Facebook is head and shoulders above the rest as she outlines. 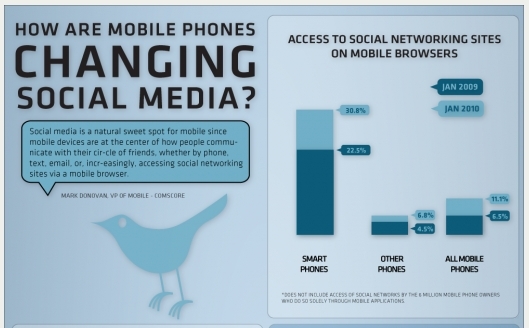 If you want a more visual portrayal of how Mobile and Social are converging, Flowtown has put together (as usual) a very compelling infograph…teaser below, click on the image for the full version. Is Google Trying To ‘Own’ Mobile? ZDNet’s Dion Hinchcliffe has a robust, and sharp analysis of Google Buzz that is definitely worth the read. My take? Your video strategy better encompass all three screens – with an increased emphasis on the Internet and Mobile platforms. I’m not saying that the 10-foot TV experience is dead, but I think you’ll see an increased customer emphasis on mobile, portable content that can be consumed on their timeline – wherever they are. What’s the take away here? There is a market for targeting customers in the mobile space. As I wrote earlier this week, at some point this may be a consumer’s only connected device. Those that aren’t interacting with their target audience via this medium are missing a huge opportunity.